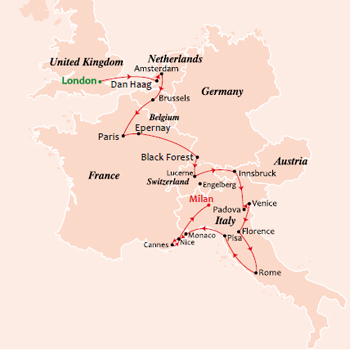 This 18-day tour lives up to its name by showcasing all that Magnificent Europe trip has to offer. Start off the tour in London, capital city of England. On the final day, participants will enjoy a continental breakfast and depart back home. Download the full itinerary for full details. Welcome to London – capital of England. On arrival check into your hotel on your own anytime after 15:00 hrs. Overnight in London. Today, on a guided city tour of London, see Westminster Abbey, the Houses of Parliament, Big Ben, Nelson’s Column at Trafalgar Square, the statue of Eros at Piccadilly Circus, the symbolic Tower Bridge and Buckingham Palace. Next, proceed on a guided tour of the Wimbledon Stadium. Later, also ride the London Eye – one of the world’s tallest ferris wheel. Overnight in London. Today, visit the Tower of London and see the ‘Kohinoor Diamond’ and the majestic Crown jewels. Next, visit the Madame Tussauds Wax Museum. Proceed to the ferry Port of Harwich and board our overnight ferry to Hook of Holland. Overnight on board. Today, disembark and drive to Lisse to visit Keukenhof Tulip Garden in Lisse, the world’s most beautiful spring garden (until 13th May). From 14th May, we drive to The Hague to visit Madurodam, Holland in miniature. Make a photo stop at a traditional windmill and visit a wooden shoe factory and cheese farm. Enjoy a canal cruise in Amsterdam. Later, we drive to Brussels. Overnight in Belgium. Today, we visit Brussels, capital of Belgium. We view the adorable ‘Manneken Pis’ statue of a little boy, as well as the beautiful Grand Place and the historic Town Hall. Later, drive to Paris. On a guided city tour of Paris, see Place de la Concorde, the majestic Arc de Triomphe, the fashionable Champs Elysees and the magnificent Opera House. Tonight is free. However, we suggest an ‘Evening in Paris’ that includes champagne at the Paradis Latin show. Later, proceed on an Illumination tour of Paris. See the famous landmarks of Paris – the city of lights, magically lit up. Overnight in Paris. Today the fun-loving and adventurous can choose to visit Disneyland, Paris and history lovers can opt for tour of the magnificent Palace of Versailles (guided tour) and the Louvre Museum. Next, visit the Eiffel Tower, the symbol of Paris, where a bird’s eye view from the 3rd level will leave you breathless! Overnight in Paris. Today, proceed to Epernay, the capital of the world famous Champagne region of France. Here, visit the cellars of the famous Mercier Champagne. Take the train and travel across a part of the 18 kms-long cellars. Also enjoy a flute of Mercier Champagne. Later, drive to the magical Black Forest region of Germany. Overnight in the Black Forest. Today, visit Titisee in the heart of the forest, a small picturesque town with a beautiful lake and surrounded by mountains. See the famous cuckoo clock demonstration. Here, take a scenic boat ride on the beautiful lake. Later, drive to Switzerland and at Schaffhausen, see the mighty Rhine Falls, Europe’s most powerful waterfalls. Overnight in Switzerland. Today is a free day, or we suggest a visit to Jungfraujoch – a majestic backdrop of ice, snow and rock with breathtaking views. Board the charming cogwheel train from Lauterbrunnen to Jungfraujoch, where you can enjoy the Ice Palace – while being encased in ice yourself! Enjoy a delicious Indian lunch on top. Later, visit Interlaken, one of Switzerland’s best known health and pleasure resorts. Overnight in Switzerland. Today, visit Mt. Titlis at 10,000ft., the highest peak in central Switzerland. Travel by two different cable cars – the second of which is the ‘Titlis Rotair’, the world’s first rotating cable car. Weather permitting, you could take a stroll on the Cliff Walk – a 100m suspension bridge 3,000m above the ground! Visit Lucerne – on an orientation tour see the Lion Monument and Kapellbrucke. Next, you can also shop for Swiss souvenirs. Overnight in Switzerland. Today, drive to Austria. Visit the Swarovski Crystal World in Wattens. Here you also have an opportunity to shop for the famous Swarovski Crystals. Next, we proceed to Innsbruck and on an orientation tour, see the ‘Goldenes Dachl’ or Golden Roof and the Heiblinghaus, a building resembling a wedding cake. Overnight in Innsbruck. Today, proceed to Venice – built on over 100 small islands, separated by canals and linked by bridges. Enjoy lunch on a private boat en route to St. Mark’s Square. At St. Mark’s Square, see the historic Ducal Palace, the romantic Bridge of Sighs, the exquisite Clock Tower and splendid St. Mark’s Basilica. We also visit the Murano Glass factory for a glass blowing demonstration. Also enjoy a gondola ride. Overnight in Venice/Padova. Today, drive to Florence and take a guided walking tour to view the Palazzo Vecchio, the Loggia dei Lanzi, a beautiful 14th century arched gallery and other historic sights. Later, drive to Rome. Overnight in Rome. Today, visit the Vatican Museum, the Sistine Chapel and St. Peter’s Basilica. On a guided city tour of Rome, you will see renowned sights such as the Monument to Victor Emanuel II, the ancient Roman & Imperial Forums and the gigantic Colosseum. Later, drive to Pisa. Overnight in Pisa. Today, visit the ‘Field of Miracles’. See the Cathedral, the Baptistery and the Leaning Tower of Pisa. Later, take a train to the stunning Cinque Terre. Set amid some of the most dramatic coastal scenery on the planet, these five ingeniously constructed fishing villages can bolster the most jaded of spirits. Drive to Nice, the queen of the French Riviera. Overnight in Nice/Cannes. Today, visit Cannes and see the Boulevard de la Croisette and the film festival center, where the stars congregate each year. Drive to Eze Village and visit the Fragonard Perfumery, where you will see a demonstration of how perfumes are made. On a guided tour of Monaco & Monte Carlo, you’ll see the Royal Palace and the Cathedral. Enjoy, beautiful views of the splendid harbour and drive along the famous Grand Prix circuit of Monte Carlo. Overnight in Nice/Cannes. Today, drive to Milan. En-route, visit Lake Como, the most spectacular of the Italy’s lakes. Later, proceed to Milan – on your orientation tour, see the Duomo and enjoy time at the Piazza del Duomo. Overnight in Milan. Today, after continental breakfast your ‘Magnificent Europe’ ends as you check out of the hotel. We hope you have thoroughly enjoyed your tour of Europe. Write in and tell us how you enjoyed it and give us any suggestions you may have. ‘Arrivederci, Au revoir, Auf wiedersehen, Vaarwel & Good-bye’ till we meet again! Surcharges applicable during Peak and Event periods • Price valid till 30th Sept. 2018.